Summerhouses are just one way you can enjoy the best of the British weather. 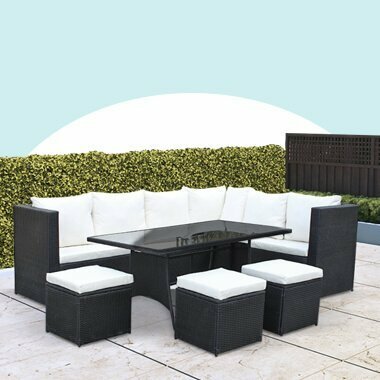 Transform your summerhouse into a place to relax with family and friends or simply a place to call your own. 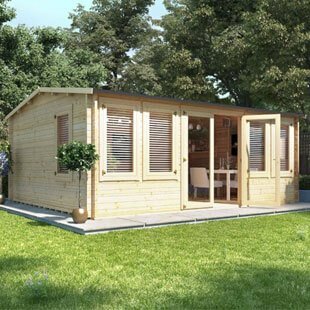 Our range of summerhouses are available in many different sizes and shapes. 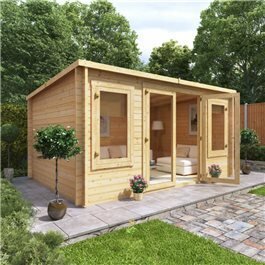 These include contemporary summerhouses, traditional summerhouses, corner summerhouses, summer house sheds and even log cabin summerhouses. Therefore, within our extensive collection you are bound to find the perfect summer house for you. And, no matter if it is a big or small, our wooden summer houses are built using tongue and groove panels. These panels are 11mm thick, and are pre-engineered to interlock together. This method of construction helps to deny water entry through the quality materials to the summer house. 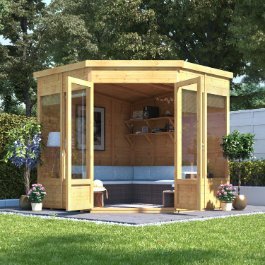 Therefore, making your wooden summerhouse protected against all kinds of severe weather. 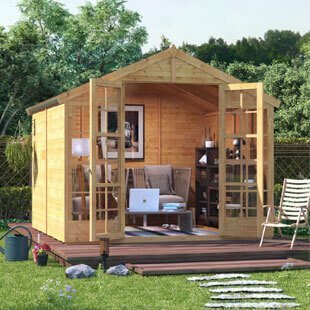 Summerhouses can be used for a multitude of purposes. 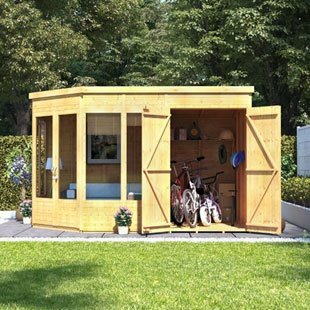 Some examples include a garden office, wooden playhouse, storage space or even a spare room. And, here at BillyOh we have timber summerhouses capable of suiting all transformations. 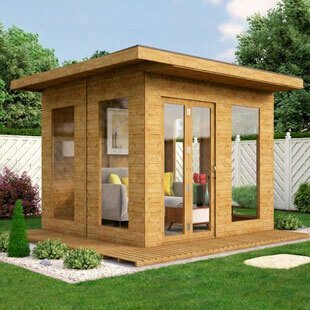 Designed with the current day in consideration, a contemporary summerhouse can be chosen with either a pent or apex roof alongside many other customisable features. A contemporary summer house could be the answer to how to give your garden a modern edge. A traditional summerhouse are best suited to those of you who are wanting to retain a grasp on the past. Designed with apex style roofs and Georgian windows, for many the charm of a traditional summerhouse can be much more appealing than that of a contemporary summerhouse. 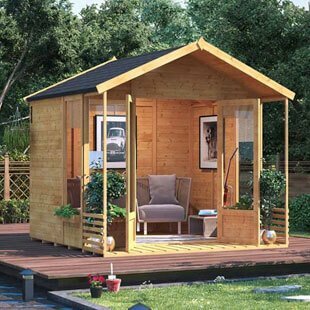 Additionally, we are fully aware that finding a summerhouse to perfectly fit into your garden may prove to be a difficult task. Especially if your garden is of an obscure shape. Therefore, an octagonal summerhouse may be the answer to your troubles. 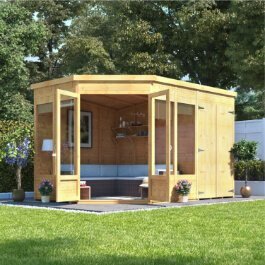 Corner summerhouses are designed with corners in mind, with the intention of helping your optimize your available garden space. Installing a corner summerhouse may cause concerns regarding the view from the building itself. But rest assured, the large window and double door summerhouses can provide you with breathtaking panoramic views of your garden too. 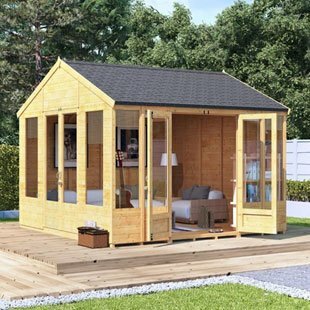 Built with small families, new homeowners and couples in mind, summerhouse sheds are the ideal solution to having two different buildings in your garden without compromising on garden space. 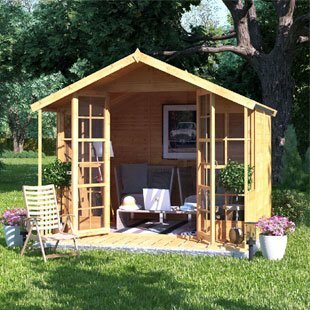 Half of a summerhouse shed is a stylish summerhouse where you can have a relaxing comfy space or even childrens playhouses. Whereas, the other half of the building is a shed perfect for storing items such as gardening tools and bikes. 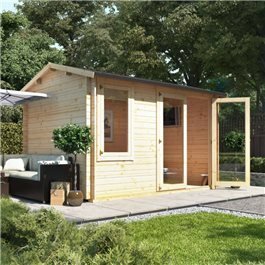 For a more luxurious outdoor building, try a log cabin summerhouse. Wide opening double doors and large glazed windows can make timber summerhouses feel like they are a costly home extension available at a friendly price. The extra price allows for a dependable log cabin design. Tongue and groove cladding, with the option of pressure treated, gives the log cabin summerhouse an opportunity to withstand harsh weather conditions. This is as log cabin summerhouses are built to last.